Bryan Municipal Utilities has earned a Reliable Public Power Provider (RP3®) designation from the American Public Power Association for providing reliable and safe electric service. Brent McKinney, Director of Electric Transmission and Distribution at City Utilities of Springfield, Mo., and chair of APPA’s RP3 Review Panel, presented the designees on April 4 during the association’s annual Engineering & Operations Technical Conference held in Minneapolis. The RP3 designation recognizes public power utilities that demonstrate high proficiency in four key areas: reliability, safety, workforce development and system improvement. Criteria within each of the four RP3 areas are based upon sound business practices and recognized industry-leading practices. BMU has received the designation four times previously since the inception of the program in 2005. BMU is one of 29 utilities that earned the designation this year. In total, 219 of the more than 2,000 public power utilities nation-wide hold the RP3 designation. The RP3 designation now lasts for three years. APPA is the national organization representing more than 2,000 not-for-profit, community- and state-owned electric utilities. 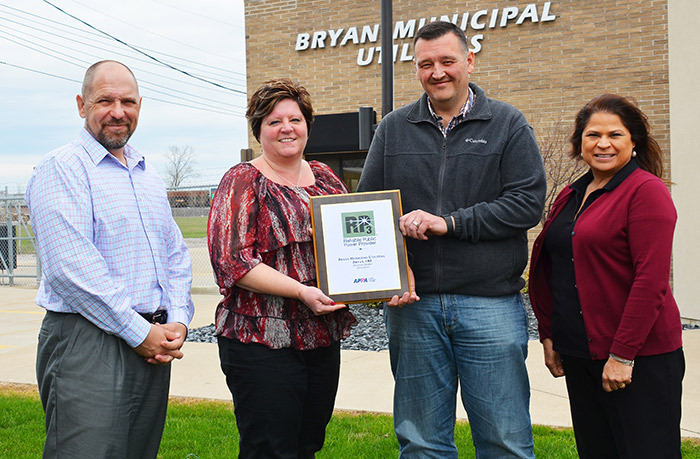 RELIABLE PROVIDER – Bryan Municipal Utilities was one of 29 public power utilities nationwide to earn Reliable Public Power Provider (RP3) recognition from the American Public Power Association for providing customers with the highest degree of reliable and safe electric service. Pictured with the award are Director of Utilities Brian Carlin, Human Resources Director Jackie Perry, Electric Superintendent Al Sullivan and Administative Assistant Sylvia Ramos.